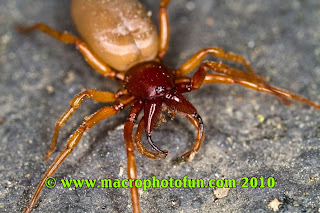 Macro Photography Daily Photo: Daily Macro Photo - "Woodlouse Spider"
MacroPhotoFun Dysdera crocata is nocturnal (this shot was taken at night in its natural habitat) and is called the woodlouse spider because it actively hunts them. It is usually found under wood or bark and prefers to hide in sheltered, damp, ground habitats like those provided by logs or rocks, and is sometimes found in urban gardens under old bricks or paving. These spiders do not build webs, however the female will build a silken sack where it will molt and lay eggs, and stay with its offspring until they are ready to leave the nest. Bites by the woodlouse spider are not dangerous, however they can be painful, since their fangs are capable of penetrating the exoskeletons of a wood louse (pill bug, sow bug) they will have no problem penetrating your skin. They are commonly mistaken for the very dangerous brown recluse spider.